Overview of Lesson: With the 2012 Olympics occurring this summer, what better time is there to read about the Olympics? The booklist below offers a couple of books that provide facts and history about the Olympics in a child friendly manner with lots of great illustrations. There are two activities that kids can do with these books: create a gold medal or the American flag! Cut two feet of ribbon or string. Tape the string to the inside of the lid. Once the ribbon is securely taped, you can wear your gold medal! Using the ruler, measure a rectangle that is 7 inches wide and 4.5 inches tall. Cut out the rectangle. In the top left corner, lightly draw a rectangle that is 2.5 inches wide by 2 inches tall. Outline this rectangle in blue. This part of the American flag has 50 stars. It may be difficult to fit 50 stars in the small rectangle, so only put as many as you like! The American flag has 13 horizontal stripes: 7 red stripes and 6 whites stripes. Since your flag is much smaller than a regular American flag, there will be only 9 stripes. Each of your stripes should be about ½ inch tall. Starting at the top, make a light mark with your pencil every half inch. Then, draw a straight line in pencil marker across the flag. Once you make sure all your stripes fit, outline the pencil lines in red. Color the first stripe red. Leave the second stripe white. Continue to color every other stripe red. Color the space between the stars blue. It should look like the picture below. Once the front is done, you can color the back the same way, but make sure the sides match! So, the blue rectangle will be on the opposite side than the front, like in the picture below. Draw and color the stripes the same way as you did on the front. After your entire flag is covered, glue the popsicle stick to the back of the American flag. Wait for it to dry, and then proudly wave your flag for all to see! This book tells the story of Olympic gold medalist Jesse Owens. With its historical text and captivating illustrations, this book is an educational and engaging choice for any reader from prekindergarten through third grade! 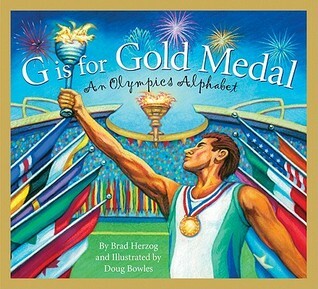 This book provides facts about the Olympics for each letter. “A” stands for Athens – the birthplace of the Olympics. The short sentences rhyme and flow, and there is additional information on the side of each page. The rhythmic nature and full page illustrations will appeal to readers between preK to third grade. This book offers an engaging read for older readers between grades 3 and 5. The main characters, Annie and Jack, go back in time to "retrieve a lost story in ancient Greece, where they witness the original Olympic games and are surprised to find what girls of the time were not allowed to do."